RUN IN THE DARK (5 & 10K), 14th November, 2018. [Thanks to Martin O’Brien for his comments]. Just under two thousand people took part in the event, held within an atmospheric Stormont Estate on Wednesday night, in support of The Mark Pollock Trust which aids spinal injury research. Whether attempting one or two laps of a hilly, multi-terrain 5K course, that is difficult enough, but it was unsurprisingly quite dark, even with the permanent lighting along the main avenues and some temporary lighting. A sizable OAC team, led by Robin Montgomery, were there to help out and essentially keep the runners on the right John track. Well done to them all. The 5K was won by Ewing in 18:01 and our only competitor OAC junior Luke Harte was a brilliant 2nd out of 971 in 18:18. Ruth Robinson was first lady in 20:10, 10th place. The 10K was won by Mark Smith in 36:42 and Liz Dawson was first lady in 43:41, 28th out of 1015. Well done to the two OAC runners who took part. Martin O’Brien was inspired by the positive vibe, in his comeback race, to finish in 48:07, 133rd place and Alison Canning finished in 54:34, 318th place. At Ormeau Park there was more OAC participation than usual, a small expeditionary force in fact, because the Seeley Cup event is here in only two weeks time. This is a great place to run, despite recent resurfacing that could have been better. The main park paths were probably laid out in the time of the 2nd Marquis of Donegall (1769-1844). His imposing dwelling (Ormeau House) stood on the now wooded ground to the left of the path where the Seeley Cup 10K race finishes. The house fell into a ruin after 1862 and was demolished before the demesne opened as a public park in 1871. Ormeau Park: Rodney Corrigan, 20:32; Gillian Logan, 22:26; Jackie Grant, 26:23. Orangefield Park: Verity Cornford, 25:57. Ormeau Park: Stephen Anderson; Ian Grant; Eric Fairfield. Lisa Fleming was at the Ecos parkrun, Ballymena – it is 20 miles away hey! John Gribben was at the Huddersfield parkrun. 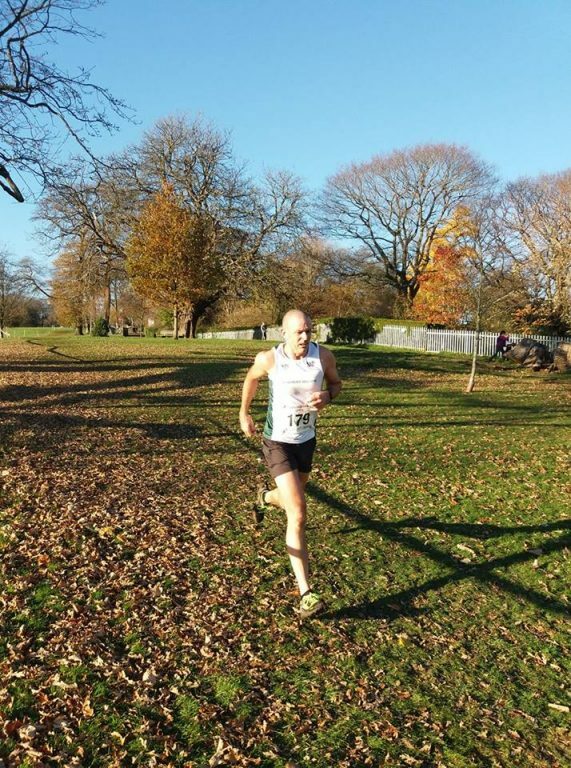 Robin Montgomery has completed 150 parkruns. BRITISH & IRISH CROSS COUNTRY INTERNATIONAL, Singleton Park, Swansea, Wales, 17th November, 2018. [Report by Brian Todd]. The annual masters’ cross country international was hosted this year by Wales in Swansea. Northern Ireland, by far the smallest nation, traditionally struggles at this level, particularly with one or two age group teams this year being incomplete or non-existent. Nevertheless, one of the great moments of the 2018 races was the absolutely breath taking performance of North Belfast Harrier’s Mark McKinstry in what was probably the main event of the day, the Men’s 35-49 Race. Mark stormed into the lead from the start and won the race in 25:10.00 and the gold medal by literally hundreds of yards on a difficult enough course. This created shock waves amongst the other nations. Brian Todd (MV 65-69) and Chris Woods (MV 50-54) were Orangegrove’s representatives in Wales. In the first race of the day (6K) Brian ran with the ladies and got around the pleasant but hilly enough course in a fairly satisfactory 26:34 to earn a few points for Northern Ireland. 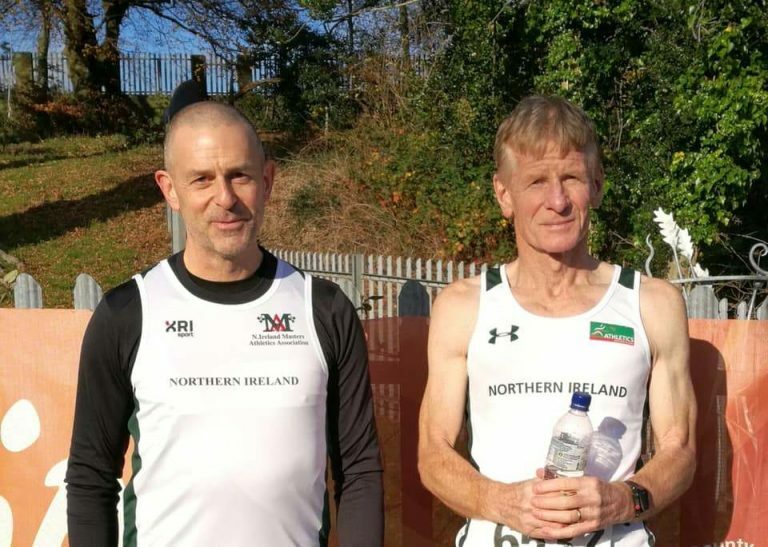 Chris had a more difficult task as reserve for the very good Northern Ireland MV 50-54 team which, in the end, won a silver medal for their efforts. On the day Chris ran in the final race, the Open (8K) and got around in the good time of 34:49. The day was blessed with fine weather and absolutely perfect running conditions. The full results are to be found on the British Masters’ Athletics Association website. Co. DOWN 5K, DOWNPATRICK, 18th November, 2018. It was fine and dry in Downpatrick on Sunday and the course was flat. Perfect conditions then for some fast running in the three races. Well done to the three OAC runners who were in Race 2. David Fletcher finished in 19:42, 4th out of 76. Edwina Ternan finished in 20:56, 2nd female and 12th overall. Rachel Woodman finished in 21:30, 20th place. The race was won by Barry Kelly (Flying Horse Flyers) in 18:55 and first female was Lauren Madine (East Down AC) in 20:28, 7th overall. MOIRA AUTUMN CROSS COUNTRY, 18th November, 2018. [Thanks to Michael O’Donoghue for his comments]. Conditions were quite good at Moira Demesne for the Men’s Open Race (8K), the penultimate race in the event, organized by Atlas Running and Jog Moira. Michael O’Donoghue was the only OAC competitor, finishing 22nd out of 34 in 34:02.5. The race was won by David Conciffe (Pace Running Club) in 29:31.2. 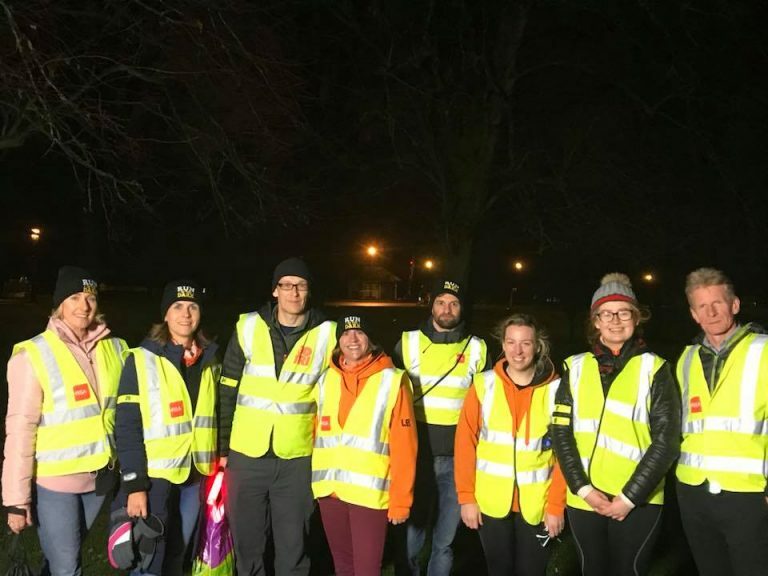 Photos: Run in the Dark, Robin Montgomery, Victoria parkrun, Jog Moira, David Fletcher, Brian Todd.